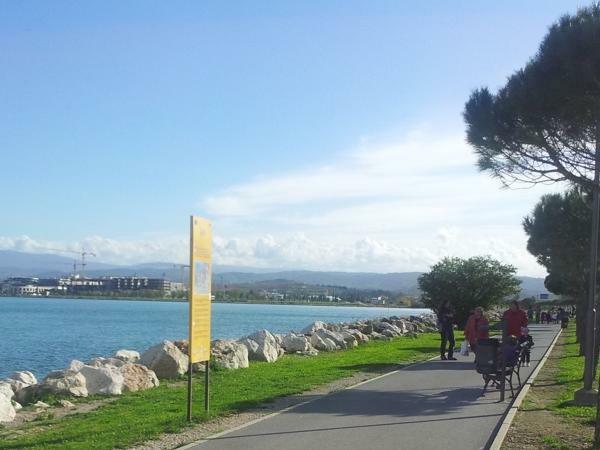 Traveler Reviews for Private Tour in Koper, Slovenia by Tour Guide Mateja K.
Mateja was awesome and very accommodating. I would certainly recommend her expertise. We were very happy we chose Tours by Locals. TOUR GUIDE RESPONSE: Dear Sheila, thank you very much for your review. It means a lot to me and I am sure it is going to be very helpful to my future travelers. Wish you and your lovely team many joyful tours and Happy Easter! Mateja did a great job organizing our tour. She chose interesting places to visit and provided a wealth of information about the sites and about the history of Slovenia; as this was our first visit. The Postojna Cave was a unique experience; the Predjama Castle was most interesting; and we found Ljubljana a charming city. As we did not want to take a long time for lunch, Mateja took us to a sidewalk cart for a "typical local lunch"; which was a lot of fun. We would not hesitate to recommend Mateja. Mateja was an excellent guide, and her wonderful stories about the history of Slovenia brought the area to life. She picked us up promptly at our cruise ship port and drove us to Ljubljana, where she introduced us to this very charming city. Given our limited time because of our cruise, she was wonderful in tailoring the tour to our needs. We skipped the caves so that we had time to see Predjama Castle and were so happy we did - it was a hit with the kids and the grandparents. Thank you, Mateja! Wonderful tour! It was a perfect day, and we couldn't have had a better experience. We cannot wait to visit again. We absolutely loved learning about and seeing your beautiful country. Thanks so much! We had a wonderful time with Mateja in our Koper excursion. She was very professional, knowledgeable, and friendly. The tour that she gave us made me appreciate Koper that I vow to come back to Koper/Slovenia and stay for at least one week. Postojna cave and Predjama castle were wonderful. I wished we had more time at Ljubljana old town! She suggested that we had lunch at Ljubljana that day since there was a local festival that day. That was a great suggestion. Thank you Mateja!!!! Mateja met our group of six at the pier in Koper. Our first impression was the vehicle - a very comfortable van - more than enough room for all. She toured us about Predjama castle and cave then on to Llubljana's old town. A busy day out of Koper, Mateja adjusted our schedule so that we avoided that bus loads of tourists, thus improving our brief stay. She is very knowledgeable which made the visit to the castle and the old town so much more enjoyable and educational. We highly recommend Mateja. We love Mateja! We were a group of six adults and had a one day private excursion with her. She is a perfect tour/driver guide. We highly recommend her. She spoke English well and she had our needs met. We fell in love with Slovenia because of how she described it. We saw places we would not have discovered without her. She is an excellent driver and we felt so safe in her van. We would want to visit Slovenia again and take her as our guide. Thanks, Mateja for the wonderful time. TOUR GUIDE RESPONSE: Dear Olga and friends, I am very greatful I had a chance to present to you a tiny part of Slovenia: unique limestone terrain -above and below. I thank you for allowing me to show you also the off the beaten track roads. I would be very honoured if you came back and meet me for even more of Slovenia. Wish a great time on your future tours and God bless you! Mateja was the best! We loved our tour of Ljubljana in Slovenia. She drove a nice van and she was very knowledgeable. Mateja went out of her way to make our time very enjoyable. We highly recommend her. Mateja provided an excellent tour. She was very knowledgeable about Ljubljana and provide insights about the capital. The market place was interesting and she also provided a good snack of local sausage and bread along with a type of strudel and a great cake for desert it was delicious. Trieste was very interesting including the connection to James Joyce and the tour of the city. Mateja tour even overcame the rain. Fun was had by all. Mateja was an excellent guide. Extremely knowledgeable about all aspects of her country and history. Very enthusiastic and kept the pace up to maximize our time. We would all highly recommend her. She also has a great sense of humor and is very personable.